Philly's newest coffee development has finally brought the city a true mobile coffee venue. 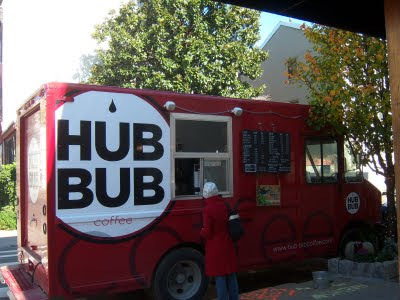 Hub Bub Coffee, a coffee truck that just drove onto the scene in October, serves up the all-too-popular coffee of Stumptown and even before the initial opening, the operation had accrued quite a bit of publicity. Since the truck often parks on 38th and Spruce on the weekdays, I tried making a stop on a recent Friday but unfortunately, my plan failed. So I tried a Saturday, tracking Hub Bub's location via twitter since the truck wanders to different spots on the weekends. And after walking a few blocks on a windy day of shopping and merriment, I caught sight of the big red coffee machine. The truck is beautifully simple enough; menu and order window on the passenger side with a shiny metal interior full of all the necessary coffee tools (fastened to the counter I believe). I requested a cup of the day's drip, Stumptown's Guatemala Finca El Injerto. The coffee had a pleasant earthiness with notes of bourbon (fitting, given it's a Bourbon Varietal), sugar cane and a little sweet cigar and black tea. The espresso, unavoidably served in a paper cup (the mobile coffee truck that can solve this dilemma should get an award! ), was pulled well and had a good showing to boot; good crema, dark body with pleasant chocolate and lime flavors ending with a sweet whiskey-esque bite. The tea is Republic of Tea. On the whole, I thoroughly dug my trip to Hub Bub. If you happen to be near U Penn on the weekdays or you're looking for a weekend treasure hunt, go to Hub Bub. In the recent past, I've made it to their Logan Square and Spruce St locations. Both bring the Hub Bub quality to the gorgeous brick and mortar structures the city so richly loves. The owner is a Penn alum & we're so happy he's returned! HubBub is creating a buzz across campus. I for one can say I'll be a regular this coming semester!